Pictoral Guide to Attic Hazards: Sick Building or Healthy Home? Your attic can be a scary place. But ghouls and ghosts lurking up there is the least of your worries. There are real and serious hazards present upstairs which often affects the health of every room in your house. 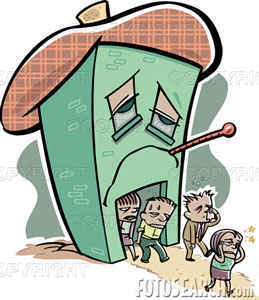 Sick Building Syndrome can be directly related to the conditions in the attics of homes. What are the hidden dangers? Might it be a critters' dream bungalow up there? What creepy crawlies and other vermiscious knids are colonizing your belfry? Is there water coming through the roof or condensing inside? 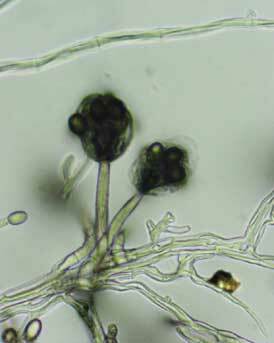 Are there hidden toxic black mold colonies in the dank nooks and crannies? Air movement in the uppermost levels of your home can influence moisture and mold, chemicals and vapors, and air leaks and drafts throughout the rest of your humble abode. To make your home healthy, you should take a top down approach, starting up in your attic. This guide will put you well on your way toward having a comfortable, energy efficient, and healthy home from your dormers down to your basement. So let's clear away some cobwebs and start rummaging through your attic to see what we might find. Attic Ventilation Fans Could Kill You! Sick building syndrome and an un-healthy home often start with what's happening in your attic. Many household products commonly found in your attic may also produce serious health hazards. Some examples are arts and crafts products, asbestos insulation, mothballs, plastic products, or rodent killer. 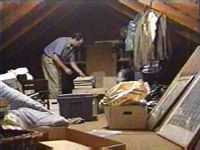 Attic storage of household products and chemicals could also represent a fire hazard. Many of the typical household items stored in your attic space are flammable. These products may contain volatile solvents with low flash points that produce highly combustible gases. This is particularly dangerous given that attics can become very hot in the summer months particularly if you have poor attic ventilation. A good rule of thumb is to keep all chemicals out of your attic space, AND HOUSE for that matter! If you wouldn't lock it in a hot car with the windows rolled up in the middle of July, don't keep it in your attic! Something else to consider is that attic flooring is the only location of insulation in most attics. Unless your home has a built in attic bedroom or attic apartment there is probably no attic insulation between the trusses or rafters, only between the floor joists. Heat usually escapes very rapidly through the roof once the outside temperatures drops. So like a desert, your attic may have a very wide range of temperature swings between night and day depending on the season. Consequently, temperature swings may cause expansion and contraction of certain objects stored in your attic such as those bottles or cans of household chemicals. These stresses have been known to cause containers to leak or off gas into the attic space. A fire in the attic might be a particular danger if your attic space contains household products such as ammunition, glues, adhesives, paint, paint thinner, or varnish remover. If you want to test attic air for hundreds of chemicals and hidden mold too I highly recommend this professional-grade home air test, but not with the pro-grade price. If you can flip a switch you can diy. No expert tester required. There are other factors to consider with regards to whether your attic is prone to fire or not. Is your attic floor cluttered with trash or debris, papers, books, boxes, old oily rags, old or leaking chemical products, old furniture, or clothes? If so, it might be time for you to kick some attic treasure to the curb by having a yard sale or by doing the EBAY thing to get rid of some of those "attic heirlooms". When you pull down the attic stairs do you have to avoid an avalanche of dust, debris, and other "stuff"? Do you smell chemical fumes or strange odors in your attic? Are there signs of water damage on the attic flooring or around your attic trusses? What is the state of the wiring in attic? Is your attic like Grandma's old attic, with exposed electrical wires or outdated wiring? What ignition sources are in your attic? Most attics don't have smoke detectors so the extra few bucks for one up there might not be a bad idea. As you'll see below, how the air moves through your attic space and up from below can affect how gas powered appliances vent their toxic exhausts so carbon monoxide detectors are also a good idea. Powered Attic ventilators and whole house fans can create significant structural damage or airborne health hazards in your home. The reason has to do with the pressure differences created inside your home due to the operation of these fans and ventilators. Because powered attic ventilators and attic fans evacuate air from the attic space to the outside of the home there is a net negative air pressure created inside the attic. Consequently, this pressure gradient results in a suction effect that induces air to move from areas in the home where air pressure is higher and into the attic where the air pressure has been lowered. On a macro scale this effect is one of the primary drivers of Earth's weather and the global jet stream. In fact, wind is basically the result of masses of higher pressure air rushing toward lower pressure areas in order to equilibrate the air pressure gradient. On a micro-scale your home also has its own weather and "wind" (or drafts) due to pressure differentials between various parts of your house. Your home can even have the equivalent of fog or cloud formation (more on that below)! Attic fans and powered attic ventilators can contribute to these "weather" conditions in your home by inducing air movement into the attic. Replacement air either comes into the attic from the outside via adjacent openings in the attic, or if the attic floor is not air tight (almost always the case) air will move through the floor from lower levels up into the attic space. Studies done by the Energy Efficient Building Association (EEBA) have shown that powered attic ventilators can pull over 600 cubic feet per minute (cfm) of air from lower living spaces into the attic. This suction effect is very difficult to avoid since the attic flooring in most homes is inherently not air tight due to all the cracks and holes around ducts, wires, vents, joists, and pipes. As the air gets sucked from lower levels of the house the negative pressure gradient extends downstairs into the living spaces and can cause the "chimney effect". This will increase energy bills due to the loss of conditioned air out of the attic and the subsequent replacement of it by unconditioned outside air at lower levels. Even a well insulated attic floor can not stop this loss of energy from your house since the air is physically pulled through the attic flooring and porous insulation. Air will also find its way around attic pull down stairs, or under attic doors. Insulation works optimally to stop radiational heat loss in the absence of drafts. Therefore, when heat is transfered physically by those "indoor breezes" blowing up toward the attic, porous insulation becomes much less effective at preventing temperature changes. Another harmful outcome of the chimney effect occurs when warm moist air from below enters the cooler attic or passes over poorly insulated central air ducts in between floors causing the moisture to condense when it contacts the cooler surfaces (hence the above mention of fog and clouds in your home). This can result in serious water damage to wood and drywall. 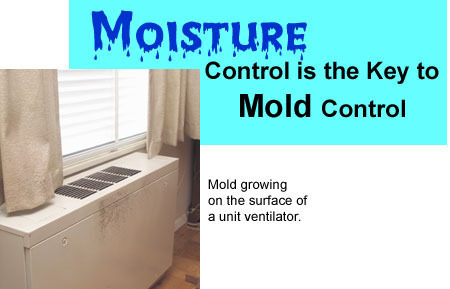 The condensed moisture can also lead to mildew or toxic black mold which releases mycotoxins into the air. These mycotoxins can cause severe allergies, asthma, sinusitis, and many other respiratory illness. 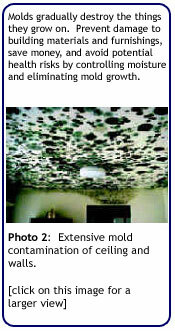 Mold in the attic is especially problematic for someone sleeping in an attic bedroom or living in an attic apartment. Perhaps the worst hazard that has resulted from powered attic ventilators and attic fans is the development of dangerous indoor levels of carbon monoxide from the back-drafting of natural-draft gas powered appliances like water heaters and air handlers. Because of the negative pressure gradient created through the house from the attic down, the carbon monoxide from gas powered appliances has been observed to vent into living spaces and has resulted in Carbon monoxide poisoning on numerous occasions. Like the air getting pulled up into the attic, the Carbon monoxide fumes get pulled into the living area. This is what is meant by "back drafting". Radon gas is something most homeowners never consider yet it is a very serious inhalation hazard that can get pulled up into the home given the above pressure effects. Radon is a deadly radioactive gas emitted from the Earth's crust as a result of radioactive decay of Uranium atoms. Radon gas seeps into the home from soil in the crawlspace or under the basement, so if air is drafting upwards this can worsen Radon contamination in your home. This could be a crucial indoor air quality problem since Radon is also the second leading cause of lung cancer and is found throughout the U.S. All homes should be tested for Radon levels since you never know how much you are breathing until you test for it. For much more specific information about Radon testing, Radon mitigation and remediation, and Radon health effects you may be interested in our complete guide to Radon. The lower the ambient air pressure is relative to that inside the appliance's exhaust duct, the more likely it is that deadly carbon monoxide gas will be sucked out into the living area. Carbon monoxide may then fill the whole house via drafts moving up toward the attic. In one of the homes tested, it took only 10 minutes for Carbon monoxide gas concentrations to reach dangerous levels following the start of a powered attic ventilator. To avoid Carbon monoxide poisoning every homeowner should install Carbon monoxide detectors throughout the home. If you have a Carbon monoxide problem you may suffer from frequent headaches or dizziness and in a worst-case scenario coma and death could be the outcome. In conclusion, given all the above possible negative consequences of using powered attic ventilators and attic fans it may be a wise move not to use them at all, especially if you have natural-draft gas powered appliances. 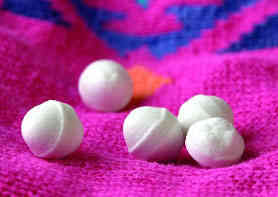 Mothballs are hazardous to your health since they are made of 1,4-dichlorobenzene (1,4-DCB) or Naphthalene. Remember how your Grandmother's Attic smelled? An antique odor of musty books and clothes and something else - an overpowering pungent odor...MOTHBALLS! No odor is associated with older attics more than the smell of mothballs. Unfortunately, that distinct "vintage" smell is caused by the dangerous chemical that mothballs are composed of known as Naphthalene. Naphthalene is one of thousands of potentially hazardous chemicals regulated by the EPA. Mothballs can be up to 99% Naphthalene and are considered toxic household products which can be hazardous to your health and especially children's health. Inhalation of Naphthalene can damage internal organs such as the kidneys, brain, and liver when misused; and Mothballs often ARE misused. The package will tell you "may be FATAL if inhaled"! However, many people don't heed the warnings and use Mothballs in unintended and unsafe ways. Mothballs are intended for use in closed containers to kill moths and their eggs or larvae. However, many people use them in a way that allows Naphthalene to sublimate into the living space where it may be inhaled in large concentrations for long periods of time. A poison control center will confirm that when Mothballs are not used as intended they can be extremely toxic to people, especially babies and young children who's organs are still developing. A few years ago the EPA recorded almost 2,000 cases of Mothball poisoning. Almost all of the cases involved children. Some symptoms observed when Mothball vapors were inhaled include: nausea, vomiting, and even kidney failure. In one instance a family was run out of their house when a pest control company tossed over 200 mothballs into an attic to get rid of birds. However, after breathing the powerful fumes for over 6 hours the family had to evacuate due to headaches, nausea, and loss of appetite. When they returned they found that rather than the birds leaving they had simply died from the fumes! In another instance a house was so contaminated with Naphthalene fumes after mothballs were used to remove squirrels from an attic. This is a common home remedy for squirrel removal; however, many people don't realize they are contaminating their homes with a hazardous chemical. In this instance the home was so badly contaminated with toxic Naphthalene every piece of insulation in the house had to be replaced, a very expensive undertaking! Mice, Bats, Raccoons, and Squirrels OH MY! Are there animals or pests in your attic? If so, you need to evict them immediately! Not only can you contract serious airborne diseases from their residues but a serious fire hazard might result from their presence in your attic. Critters love attics because they are often dark, quiet, and have openings through which they can enter from the outside such as soffit vents or attic gable vents. You can often detect animals or bugs in the attic by the tell tale signs they leave behind or noises in the attic. Those rasping and rattling sounds at night might not be ghosts of ancestors in the attic afterall! You might have some uninvited houseguests living in your attic! Often you can pull back the attic insulation or look under debris to find signs of mice infestation. Often nesting materials like bits of hair, chewed up paper, cardboard bits, or lint will be visible. Small black feces pellets will often also be visible. Gnaw marks on wood and boxes may also be signs of mice or other rodents in the attic. Paw prints may also be seen. Beware of rodent feces, urine, saliva, and any other residues when cleaning an attic because rodents are known to carry the Hantavirus which affects humans with Hantavirus cardiopulmonary syndrome or Hemorrhagic Fever with Renal Syndrome (HFRS). There have been many cases of humans contracting and even dying from these diseases particularly in the western United States. If these particles become airborne or aerosolized the virus can be inhaled and a two to four week incubation phase will begin. Ultimately, the affects of Hantavirus on the heart and kidneys can be fatal. Beware these and other Bioaerosols when your clean the attic! Image to the left is of Histoplasma capsulatum yeast cells parasitizing Macrophage cells. Image on to the right is from a colonic biopsy which shows granulomata and histiocytes filled with yeasts of H. capsulatum. Another disease that has been contracted by homeowners with pigeon, starling, bats, and other birds in their attics is known as Histoplasmosis. This disease is caused by the fungus Histoplasma capsulatum which often occurs in soil under old bird droppings; however, the disease has also been contracted from bird or bat droppings in attics. Unlike with bird droppings, bat droppings do not need to be old to be a source of Histoplasmosis. Fresh bat droppings have been shown to spread the disease. Histoplasmosis fungus can affect both humans and animals and is common in the Ohio and Mississippi river valleys of the U.S. Histoplasmosis can result when spores of the fungus are inhaled such as while sweeping up old bird droppings in a roosting or nesting area. There have been cases where bat infestation was so severe in an attic that the homeowner contracted Histoplasmosis without direct contact with the attic space. In one home after the owner was diagnosed as having a rare complication of Histoplasmosis known as Ocular Histoplasmosis Syndrome (OHS), it was discovered that the attic contained over 12 inches of bat guano (feces) and was the likely source of infection! If you find you have bats in the attic it is likely they will be one of three species: the evening bat, the Mexican free-tailed bat, or the big brown bat. Some bats are on the rare and endangered species list so whenever possible they should be evicted from the attic without needlessly killing them. 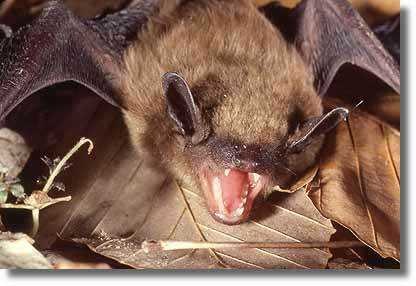 Bats are beneficial species that consume a lot of nuisance insects in your neighborhood. Bats catch those insects and navigate not by sight, but via a phenomenal sense based on echolocation using high frequency sound waves. It would be ashamed to harm one of these amazing little animals. Just be aware of the diseases you can contract from them and avoid direct contact with them so the bat can not scratch or bite you as you encourage them to leave. A Brown Bat smiling for the camera. To prevent bats from returning to the attic you can install what's known as a bat excluder. This can be as simple as a sheet of plastic or netting nailed at the top of the entrance hole which extends 2 feet down past the hole and is left un-nailed at the bottom. Its like a trap door they can fly through on their way out but won't be able to push through to get back into the attic. Then once they all leave, seal the holes through which they entered the attic. You should try to install a bat excluder any time except between May 1st and August 15th since this is when flightless baby bats may be present which will die once the adults leave. Of course, if bats have invaded your attic you should take action immediately before too much of their guano builds up and the possibility of airborne disease transmission increases. For more information contact your local Department of Natural Resources. The National Institutes of Health estimates that only about 5% of those exposed to the fungal spores are at risk of developing Ocular Histoplasmosis Syndrome, which can result in blindness. 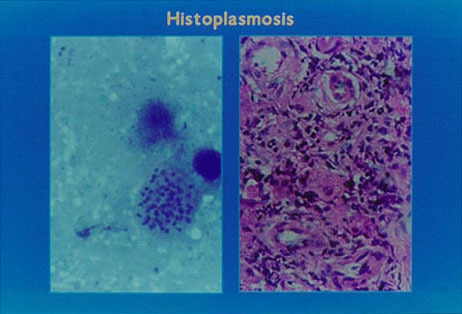 However, most cases of Histoplasmosis infection are mild with no symptoms or minor flu-like sickness. Sometimes, however, the diseases may result in high fever, pneumonia, blood abnormalities, or even death. An estimated 4% of bats submitted for Rabies testing have also traditionally tested positive for the disease. Since rabies is potentially fatal, contact with bats and other wild animals should be avoided, particularly in your Attic! To safely capture and remove live bats from your attic you can contact your local animal control officer. Since bats will usually try to bite you if you hold them, never pick them up by hand. Use a shovel or tongs to pick them up. If a person or a pet has been bitten or scratched by a bat, try to capture the bat without touching it and being careful not to crush its head. Then contact your local health department for advice immediately. If the bat has been killed you should place it in an air tight ziploc bag and refrigerate it. DO NOT FREEZE IT! These tips will help if the bat is to be tested to see if it is infected with Rabies. 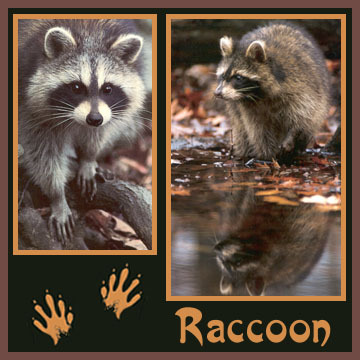 There have also been cases of people cornering Raccoons or a squirrel in the attic and being infected with Rabies when the rabid animal bit or scratched them. 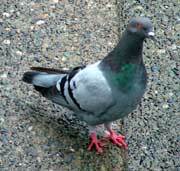 Cryptococcus neoformans fungus may be found in pigeon droppings and can cause an infection called Cryptococcosis or Pigeon Fever. Pigeon droppings are a huge problem in urban areas such as in or around attics, buildings, cupolas, ledges, water towers, overhangs, window panes, and on roofs. Pigeon droppings are also a primary source of the fungal disease known as Cryptococcus neoformans. Like Histoplasmosis the yeast-like fungus cells are often found in droppings in or around roosting and nesting locations. Most pigeon roosts and nests will test positive for Cryptococcus. If the fungal cells are inhaled Cryptococcosis infection may result; however, like Histoplasmosis symptoms are usually mild unless someone with a weakened immune system is infected. For example, if someone with Acquired Immune Deficiency Syndrome (AIDS) inhales Cryptococcosis cells the infection could very well reach a life-threatening degree. First the infection would start in the lungs and then it could spread to the Central Nervous System where it is fatal unless treated. Other groups at particular risk could be babies, children, elderly, or someone who is already infected or recovering from another respiratory ailment like Bronchitis or Pneumonia. Another rarer form of Cryptococcosis is known as the cutaneous form and it can affect the skin with acne-like soars and ulcers having nodules under the skin. The cutaneous form of Cryptococcosis usually does not spread to other areas of the body. Another bird disease that can affect humans is known as Psittacosis. Symptoms are also usually mild; however, serious infections are possible depending on the individual's immune system or respiratory health. Many species of birds are known to be carriers of Psittacosis including Sparrows and Pigeons. Sparrows may also be carriers of an encephalitis virus called Saint Louis Encephalitis virus which ultimately comes from mosquitoes that infect the Sparrows. 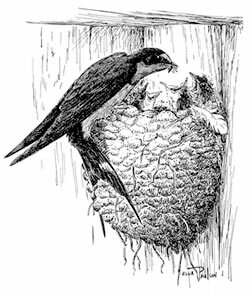 Many other pests and parasites are associated with bird and bat roosts or nests. Most of these avian parasites aren't transmitters of diseases to humans; however, they may bite and cause irritation. These may also invade your attic and other parts of your home if not controlled. Some examples of parasites that may be found around nests or roosts include: Carpet beetles, Pigeon flies, bat bugs, soft ticks, Northern fowl mites, biting lice, chicken mites, and pigeon nest bugs. Usually these parasites are dependant on their avian hosts to live so once you eradicate bird or bat roosts and nests from your attic or outside of your home most of the bugs will disappear along with the birds. Soap and water may help to clean up small amounts of residual droppings or other debris (just beware of all the above diseases that may come from those droppings). If large quantities of droppings or other bird related debris needs to be cleaned up it may be wise to consult a professional such as an environmental engineering specialist for advice. When cleaning up large amounts of droppings and other nesting or roosting debris, certain precautions have to be taken to avoid infections from the above described bird-born diseases. For example, to isolate airborne biological contaminants, the air handling system must be shut off, and the ducts must be sealed. In confined spaces like your attic it is especially important to wear a respirator with a HEPA filter able to filter out particles smaller than 0.3 microns in size. It's also a good idea to wet the area down by misting with water to help prevent spores, bacteria, or viruses from becoming airborne. Skin should be covered as well. The pros usually will done hats, face shield, coveralls, gloves, and shoe coverings in addition to the precautions mentioned above. Anyone cleaning up any type of biological contaminants like bird droppings, mold, mildew, soil, feathers ect. should also be in good health in order to keep from acquiring an opportunistic infection on the heals of another sickness like the flu, cold, pneumonia, or bronchitis. While cleaning up the area try to avoid the use of insecticide or pesticide whenever possible. You don't want to jump out of the frying pan into the fire as they say. It's also a good idea to collect the animal wastes in a sealed plastic garbage bag, rinsing the outside before disposal. When finished handling the potentially infectious materials, keep your respirator on until after you have removed your protective clothing and sealed it in a plastic bag to avoid inhalation of any particles stuck to your person. Afterward you should take a shower. Consult your local trash collection authority to determine whether the wastes can be disposed of through the usual trash collection methods. You will also want to modify the attic area or other locations to prevent the pigeons, bats, or other birds from re-colonizing the area. Bacteria, mold, viruses, pet dander, pollen, yeast, and dust mites are some common biological air pollutants that contribute to the microscopic jungle within your home. For more information about the hazards of living things besides yourself in the attic, visit our Guide to Biological pollutants. We also have an extensive chart and guide which lists specific biological agents and the disease they cause, visit our extensive chart of Fungi, Bacteria, and Viruses Bioaerosols. Many attic pest leave behind signs of nesting or food or old skins from molting. Snake skins in the attic isn't out of the question either, especially in the southern states like Louisiana where they have been known to enter attics in search of prey like rodents. Mice, rats, bats, or a squirrel in an attic can be a very dangerous hazard since these critters often harbor diseases and can damage the structure or attic wiring causing serious fire hazards. Check for openings around the attic door, attic vents, roof joists, rafters, and attic floor joists. Look for sunlight streaming in through cracks in the attic during the day and seal these openings with caulking, or in the case of squirrels wire mesh or wood. Air movement, moisture, insulation, chemicals, and biological pollutants all contribute to sick building syndrome. Take a top down approach to building a healthy home environment. Houses have their own weather, climates, and air masses. What happens in the attic affects what happens in other rooms of your house. One of the best attic tips for reducing the temperature in your attic is to install a solar attic fan or solar roof fan for low-cost effective attic ventilation. They are easy to install into the attic gable or roof, require no hard wiring or electrician, and cost a few hundred dollars at most. Best of all, solar powered attic fans are energy efficient not only to run, but will also remove heat from lower levels in the home in summer, thus saving money on your energy bill. Thus, with the energy savings from a solar powered attic fan you will recoup your costs in only about 2-3 years. After that, these solar fans are free to operate since they get their power from the sun. Talk about "cash in the attic"! The solar attic ventilation fans may help to reduce toxic mold or mildew in the home since they are also helpful in ventilating the attic and lower levels of moisture. These fans are an excellent home investment and they are also an excellent way to ventilate the attic. There are also larger electric powered attic fans (also known as whole house fans) that can be installed between the home's living space and the attic space. These attic exhaust fans are typically installed in a space cut into the attic flooring above a hallway area. They are very powerful, almost like having an airplane propellor mounted in your ceiling. They can be set to cut on or off based on humidity and temperature levels in the living space. Most whole house fans have a built in attic fan cover in the form of Louvers which close when the fans aren't turned on. These louvers can be a source of air leaks when the fans are not being used so an insulated cover may need to be placed over the fan to keep air from leaking into the attic during the winter. Differences in air pressure in your home causes air drafts and the chimney effect which can cause poor indoor air quality and increased energy costs. So how's the weather inside your home? As discussed above, Whole house fans can be potentially dangerous since they create low air pressure from the bottom levels up through to the attic. Therefore, back-drafting of gas powered appliances has been known to cause Carbon Monoxide to build up relatively quickly in houses where these whole house fans are operated. There also may be problems with moisture build up. More on the details of these fans and the problems they can create below. These whole house fans can be turned on in the warm months when the house is hot inside but the outside air is cooler, such as after sunset. They create quite a strong breeze into the house. Thus, due to the strong negative pressure they create, you have to make sure and open a screen door or some windows so air can come in from the outside to equilibrate the air pressure difference. In spring this can be a problem, since you will pull a lot of pollen or moisture inside. Likewise, if ground-level ozone, smog, or other air pollutants outside are high, these whole house ventilation fans may pull pollutants indoors. Whole house fans also are only able to cool your house no lower than is the outside temperature. However, If outside conditions are right it only takes a few minutes to cool a house with these larger attic fans. These whole house attic fans also work like a charm to pull indoor air pollutants out of the living space. For example, if you burn food in the kitchen it takes only a few minutes to clear the house totally of that toxic smoke which has been shown to contain high levels of dangerous polycyclic aromatic hydrocarbons (PAH). Just remember, the air evacuated into the attic has to go somewhere, hopefully outside, so make sure there is a clear route for attic ventilation such as soffit attic vents or Gable vents. Another attic tip regarding recessed lighting will also help save money on your energy bill and help prevent a fire in the attic as well. Attic insulation around recessed lighting has always been a problem because many recessed can lights aren't rated for contact with insulation. Therefore, insulation can not be placed around the lighting housing due to the danger of fire. A helpful tip is to staple a piece of spare standard window screen to the attic joists on either side of the housing. Tuck it beside the housing so you can pull the attic insulation up closer to the housing and help stop conditioned air from infiltrating up into the attic from the living space below. Caulking also helps here too, though beware the fumes from caulking. These fumes are very dangerous to inhale for any length of time, particularly in a poorly ventilated attic! Of course if you used the new "Green product" known as Bio-Based Insulation you wouldn't have to worry about ineffective attic insulation or fumes! Bio-based insulation is a new sprayable soybean-based polyurethane foam insulation that expands up to 100 times in volume and fills every crack and crevice. It's made using American grown soy beans so it uses less resources making it a great environmentally healthy and non-toxic way to create a healthy and energy efficient home. You'll be hearing a lot more about soy beans and green products for your green home in the future. Once you've got your new eco-friendly soy-based insulation, you'll want to be sure to seal up any cracks around any other light fixtures, ventilation fans, flues, plumbing vents, pipes, or electrical wiring in the attic. This will help stop the "chimney" effect whereby the air you are paying to condition or heat downstairs is getting sucked up through the cracks and lost through the attic vent, while cold air is being pulled into the house at the lower levels. Speaking of insulating your attic. It is important to check if you have enough insulation in the attic by measuring the depth of insulation with a tape measure or ruler. When doing this be sure to have a light in the attic so you won't step in between the floor joists and break through the sheet rock ceiling to the room below! If you have a well insulated attic floor this might be a problem since the floor joists probably won't be very visible. If, however, the joists are visible there's a good bet you'll definitely need more insulation to achieve the minimum recommended R22 to R49 (7 to 12 inches) of insulating capacity. To insulate an attic properly isn't a difficult task, but it may be a hazardous task since most man-made insulation materials are inhalation hazards and skin irritants. One of the worst experiences I ever had was making the mistake of installing satellite cables through my attic filled with blown in fiberglass insulation without wearing a dust mask. Yes, I was younger and more foolish back then. It didn't take long till I inhaled enough fibers to cause some serious respiratory distress. For half a day I thought I was going to cough up a lung. I'm sure some of those fibers are still lodged in my bronchiole tubes and lungs even after all these years. Take my advice, protect yourself from insulation fibers. They're almost as bad as asbestos fibers. When adding more insulation always wear long sleeved shirts, long pants, gloves, safety glasses, and dust mask. Most homes in America are insulated using fiberglass insulation which comes in rolls or batts or in the form of blown fiberglass (the kind that I inhaled.) Some homes also have cellulose insulation, which is paper-based insulation typically blown into the attic or walls. Another new Green product for healthy homes is called UltraTouch Natural Cotton Fiber Insulation. This attic insulation is made using 100% recycled materials such as from jeans and it's non-toxic and non-irritating. Ultra Touch insulation is earth-friendly because a minimal amount of energy is used to manufacture it as compared to non-biodegradable Fiberglass insulation. Now back to your musty attic. 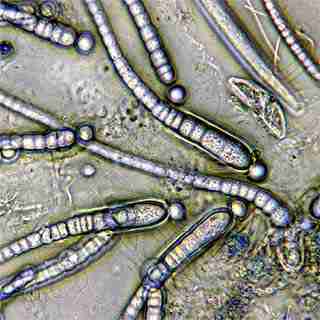 Moisture is to mold growth as mold spores and mycotoxins are to your allergies and asthma. It's a common toxic analogy in a sick house. If your attic smells too musty you might have a mold or mildew problem. This can also be a sign of poor attic ventilation, water infiltrating into the attic from roof leaks or ice dams on the roof in winter, or even air leaking in from the living areas through the attic floor. Besides checking for roof leaks, you can also check to make sure your soffit vents (near where the rafters rest on the outside walls) aren't blocked by insulation or anything else. Keeping the soffit vents in the attic clear will allow air to circulate above the attic flooring insulation so warm moist air from the living area can be exhausted. Otherwise, this moisture has been known to condense in attics causing problems with rot from mold or mildew growth. Sealing all the little spaces around your attic door, attic folding stairs, pipes, ducts, fans, wires, or chimneys can not only help reduce your energy bill but will also help to prevent warm moist air from seeping into the attic and condensing on the cooler surface of the roof sheathing, a major cause of mold problems in the attic. You should also check to make sure clothes dryers, bathroom fans, and oven hoods are all vented to the outside of the home rather into the attic space. 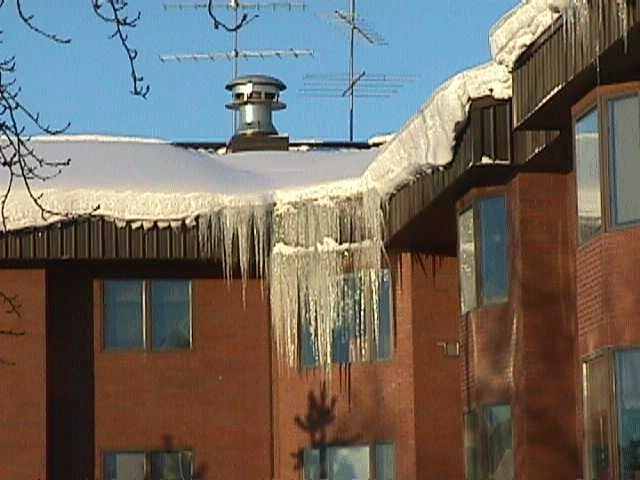 Example of severe ice damming on an apartment building. Notice the obvious snow melt on ridge line around exhaust outlet. This water is running down the roof and refreezing when it reaches the colder soffit area. This is a perfect example of ice damming that will result in serious indoor air quality problems as well as water damage. Ice damming is a common problem in both old and new homes with steep, complex roofs and is caused by excessive heat build up in the attic. Ultimately, ice damming is one of the leading causes of water damage to the attic rafters and roof sheathing. Not only will moisture from Ice damming seep in under the shingles to cause wood rot, but it may also reduce the R-value of attic insulation and can also lead to serious biological inhalation hazards such as from toxic black mold spores. So if your fuel or electricity bills seem excessive, you have signs of water damage in the attic or under your shingles, and you wonder if your allergies, asthma, frequent colds, or sinusitis are related to sick building syndrome - you may have excessive heat building up in your attic resulting in ice damming. Are you living in the "House of Seven Gables"? If so, your complex roof line may make ice damming much more likely due to more temperature variance in spots and trapping of snow between dormers. Got glaciers on your roof?! The more complex the roof the more likely ice damming is. If your roof line is like the "House of Seven Gables" you may have problems with ice damming due to how the dormers and gables funnel and trap snow. The equivalent in nature is when glaciers form in mountain valleys. Also if the air in your attic is more than 15 degrees warmer than the outside air, you most likely have excessive heat in the attic due to poor attic ventilation and or energy leakage from the lower living spaces. 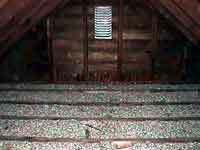 This excessive heat in the attic worsens the problem since snow melts where the roof is warmed by this internal attic heat, then travels down the shingles until it encounters colder regions on the roof such as where the walls meet the trusses of the roof, where the soffits begin, and over porches. The water then refreezes and causes an ice dam to form on the roof. This damming affect will impede liquid water from draining from the roof adequately; therefore, the water can seep under shingles and begin a domino affect of structural damage, more heat loss due to reduced R-values of insulation, increased heating bills, and possibly toxic mold problems. So why do you have excess attic heat? Well that depends on two main factors: how heat enters your attic and how heat exits your attic. Both of these factors depend on your home's design and can greatly impact whether or not you have a host of other structural or indoor health problems. It's amazing how important the attic of a home is to all the other variables involved in having a healthy home. So you literally have to take a top down approach to indoor air quality and especially with one of the leading causes of sick building syndrome, ice damming. So get up there and let's take a look at what's under the hood...err..I mean roof. Once you're in your attic, analyze how your attic can "breathe". Are there ridge vents, soffit vents, gable vents, attic vents or fans and are they all clear or open? Remove snow to unblock the ridge vents or gable vents and never cover them in the winter assuming that you will trap heat and reduce your heating costs. This will only reduce the attic's ability to breathe and will lead to yet more ice damming that will cost you much more in many ways in the long run. Also check to make sure insulation is not covering the soffit vent holes. If so, soffit vent protectors may have been omitted when your home was constructed. Install brackets to keep insulation from covering the soffit vent holes. These vents are designed to allow air to enter the attic to allow for attic ventilation and to prevent excess heat buildup. 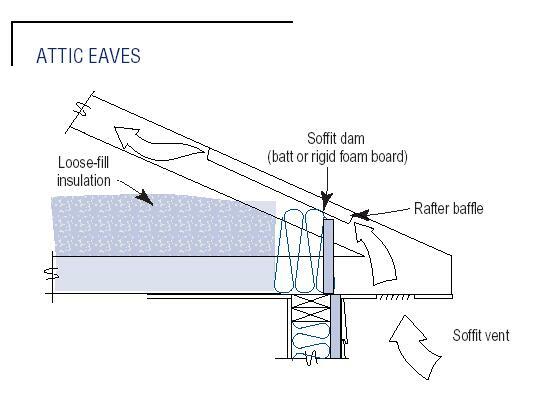 Use soffit dams to keep loose fill insulation from stopping air flow into the attic through soffit vents. Now take a look at the insulation in your attic. Is is sufficient in depth and R-value? An R-value of R-38 (or 12 inches) is generally preferred but may vary depending on where you live. Are there gaps or uninsulated patches? Do you have a chimney and is the shaft insulated? Your chimney is one of the most common and biggest sources of major heat loss to the attic. If you have a ventless gas fireplace and you can see down the shaft toward the living space and see no insulation on the sides or over the shaft your home will loss massive amounts of heat up this shaft even when the fire place is not being used. This could be at the heart of your ice damming and energy bill problems too. In summer heat will reverse direction down your chimney shaft and flow into the home thus increasing your cooling bills too. Insulate that chimney shaft but watch out for fire hazards when you do so! 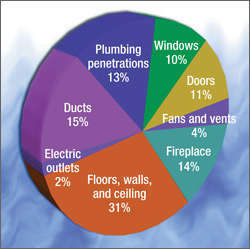 Here are the most common points of air leaks in houses. Since heat rises through the home, these air leaks can be the source of excess heat in the attic contributing not only to ice damming, but also to increasing fuel or electricity bills. - 1) Dropped ceiling, 2) Recessed light, 3) Attic entrance, 4) Sill plates, 5) Water and furnace flues, 6) All ducts, 7) Door frames, 8) Chimney flashing, 9) Window frames, 10) Electrical outlets and switches, 11) Plumbing and utility access. Is your central air unit in the attic? I sure hope not. If so it can contribute to a build up in heat in the attic as well as causing direct water damage if the catch pan ever fills up and overflows. HVAC drain lines also will likely become clogged at some point in time and cause water leaks from the unit. Ultimately this water can damage your home the same way a roof leak would, so again you get structural damage and then biological damage as mold and mildew thrive. Your sneaky slithering home owners insurance company may also try to classify it as flood damage which isn't covered under most basic house insurance policies. Do you have recessed lighting? Are the recessed lighting cans protruding through the attic floor uninsulated? If so, these can be major sources of heat loss into the attic. Are they standard recessed lighting cans or are they rated IC for direct "Insulation Contact"? If not especially rated for insulation contact you could have a fire hazard if insulation is in contact with the lighting cans. Some building codes require at least 3 inches leeway around standard non-IC lighting cans, this certainly doesn't help stop heat from escaping through them. Therefore, one trick you can do is build a box around the can using standard window screen. Staple the screen to the rafters or joists so that insulation can be applied to it to form a heat barrier, but make sure the screen allows for the minimum required space between the insulation and the can. In some homes with very shallow roof pitch these recessed light cans have contributed to ice damming by causing localized heating in spots on the roof and thus ice melt in those areas. Don't under-estimated how much heat comes from these lighting fixtures. Not only do they directly produce heat themselves but they are a conduit for ambient heated room air from living spaces below to enter the attic and contribute to excess attic heat. Use double walled recessed light cans rated for direct insulation contact so they can be insulated over to prevent this heat from escaping upwards. For more information check your local building codes. Other areas where heat can infiltrate into the attic is around the attic door, attic stair hatch, or attic sidewalls facing heated areas. Install pieces of insulation with the vapor barrier facing the heated side. Also seal cracks and holes using caulking, weatherstripping, trim, and door saddles. Another little known point of heat and moisture entry into the attic is at bathroom, dryer, or kitchen stove hood exhaust ducts that end at the soffit vents. Many builders place the exhaust ducts at the soffit vents with the assumption that the vapor and heat will vent to the outside; however, soffit vents are design to allow air flow INTO the attic, so whatever vents out of these exhaust ducts will probably get sucked right into the attic as air flows in from the outside through these vents. Exhaust ducts should vent directly outside via duct vents, not the soffit vents. 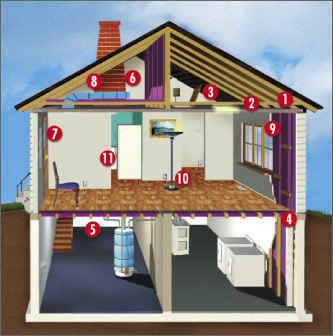 Here are the top eight points of air infiltration into and out of your home and also prime areas to investigate if you want to lower your fuel or energy bill. Make sure your home has soffit vents and that they aren't blocked. For homes constructed without roof overhangs new products exist that can be installed near gutters to allow in through the eaves. Make sure your home has ridge vents, gable end vents, or roof vents since the apex of the roof is where the heat rises to and will be able to escape. If you have ridge vents make sure they were installed properly. Many times they are installed incorrectly such that the sheathing isn't cut away properly, and shingles or felt paper may be blocking the opening. 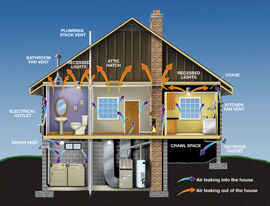 If air can't vent excess heat build up in the attic thus causing ice damming and many of the above discussed problems. Don't smother your home's ability to breathe by covering any attic vents with the notion that you are saving energy from escaping. YOU ARE DOING THE OPPOSITE plus creating a health hazard via possible mold spores from ice damming or humidity to boot! Be careful of humidifiers. When operated excessively and with poor attic ventilation, humidifiers can greatly contribute to mold, reduced R-values of insulation, and structural water damage when the water vapor condenses on the cooler attic surfaces. Keep in mind that some powered attic ventilators are thermostatically controlled and therefore will not work in winter. They also cause a host of problems of their own, such as Carbon Monoxide poisoning, as discussed above. Gable end vents may be more beneficial. Survey your home for signs of black mold or mildew problems. On a windy day light an incense candle and observe how the smoke moves near windows, doors, electrical boxes, electrical outlets, pipes, plumbing fixtures, ceiling fixtures, ducts, wires, and vents. If the smoke moves horizontally, you have a draft and therefore a major point of air leakage. To stop air movement up towards the attic use weatherstrip, sealants, and caulk where there are openings, cracks, or seams between heated and unheated spaces. Install rubber gaskets to insulate behind switch plates and electrical outlets. Install double pane windows which are much more energy efficient than older single pane windows. Look for dirty spots on insulation. This will indicate an air leak and can be remedies with plastic sheeting and caulking behind the insulation. When your vented fireplace is not being used close the damper so heat isn't escaping up the chimney! Just don't forget to open it to allow smoke to escape when you light your fireplace! For new homes make sure your builder uses house wrap and seals all seams between pieces of wall sheathing such as between OSB boards. Install gaskets and insulation at attic hatches to stop air infiltration from lower areas in the home. Remodeling an attic can be a scarry thing, not necessarily because of attic poltergeists, but because of other man-made ghosts and ghoulies like asbestos, solvents, formaldehyde, lead in paint, and chemical strippers and finishings. Just avoiding products that contain these dangers does not mean that you won't be exposed while remodeling an attic because your attic may already contain some of them. For example, until the 1970's homes were still being painted with lead-based paint. Likewise, stove pipes, floor tiles, fire-proofing, and ducts were still being installed that contained asbestos. The more deteriorated or "friable" these materials, the more asbestos may be released once they are disturbed such as during an attic renovation. Vermiculite insulation mined in Libby Montana in the 1990s and known by the brand name Zonolite has also been proven to contain dangerous levels of Asbestos contamination and may have been placed in millions of U.S. home attics! An indictment has been brought against the manufacturer, W. R. Grace and Company, and the whole vermiculite insulation fiasco has been called the worst case of widespread public exposure to a hazardous material in history! For all the details, pictures, and resources about the public health crisis, visit our guide to vermiculite insulation. In some cases homes have been completely contaminated with Asbestos fibers resulting from the Asbestos tainted Vermiculite insulation. If you suspect your home contains these materials it's best to NOT to disturb them and to consult a professional before beginning your remodeling project. Breathing asbestos can be fatal years down the road. Regular dust masks and respirators won't prevent inhalation of very damaging asbestos particles so DON'T ATTEMPT TO CLEAN UP ASBESTOS CONTAINING MATERIALS (ACM)! Asbestos inhalation strongly correlates to lung cancer, mesothelioma, and asbestosis which can all kill you. Worse yet if you are a smoker the risk of these respiratory diseases following asbestos inhalation goes up tremendously! So leave asbestos alone, and also quit smoking too! Other tips to prevent exposure to lead-based paint or asbestos containing materials such as vermiculite insulation include: keeping children out of the attic or other areas where these materials are suspected. You should also avoid storing boxes or other items in these areas which when retrieved can disturb the hazardous materials. The goal is to prevent disturbances which can result in airborne particles or fibers. Ultimately, hire a pro for safe removal. Formaldehyde gas is release from all kinds of synthetic household items and materials. Another common airborne hazard of remodeling an attic space is from Formaldehyde which is a volatile cancer causing gas released from many types of household products and building materials. Some common sources of Formaldehyde are: pressed-wood, glue, particle board (OSB board), wood preservatives, adhesives, furniture, and paneling. Formaldehyde gas has been proven not only to cause cancer but also may produce symptoms such as irritation of the eyes, nose, and throat. It may also cause respiratory distress, including coughing and wheezing plus fatigue, headache, nausea, kidney and liver damage, rashes, allergic response, and dizziness. For much more specific information visit our Complete Guide to Formaldehyde. You detect Formaldehyde via odor, hiring an environmental testing firm, or with a do-it-yourself Formaldehyde test kit. If you detect a problem from Formaldehyde you may want to attempt to control it by using plastic laminate, varnishes, or special Formaldehyde sealants that can keep it from volatilizing from surfaces that contain it such as in drawers, cabinet interiors, counter-top undersides, and other exposed wood surfaces or edges. There are also certified low Formaldehyde products you can use when remodeling your attic or any other interior space. You can also control humidity in your home which can help to reduce Formaldehyde off-gassing from surfaces, not to mention reduce the dangers of toxic black mold growth. Household chemical products are often used carelessly when renovations are undertaken. Unfortunately, attic renovations involve a very confined space with very toxic chemical gases and particles. Other chemical household products may pose hazards while renovating an attic space. Volatile Organic Compounds (VOCs) are released from a host of products used for remodeling. Paints, wood strippers, adhesives, waxes, cleaners, and wood strippers are common emitters of VOCs and often have low-VOC alternatives available. Some household products and chemicals also give off fumes which are highly flammable and toxic to humans and other animals. Some examples of these solvents and chemicals are: methylene chloride, carbon tetrachloride, mineral spirits, chlorinated solvents, petroleum distillates, trichloroethane, benzene, and toluene. 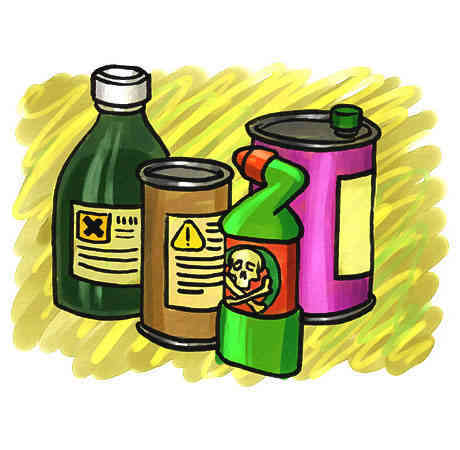 For much more information about toxic household chemical ingredients visit our Extensive Household Chemical Encyclopedia - Product Manufacturers' Toxic Trade Secrets?. Trade Secrets may be secret for a reason - MANY ARE KILLERS! For specific company contact information for the 354 big household chemical manufacturers and which of the over 6,000 household product brands they each make visit or Complete Product Manufacturer Directory. For general product safety information visit our guide to household products safety. In Case of Emergency you can reach your local Poison Control Center by calling (800) 222-1222 from anywhere in the country. Thank you for visiting our complete guide to a healthy attic and healthy home. See there's more than just "flowers in the attic", that's for sure!